Announcement I love creating with felt! In my shop you will find a myriad of original, handmade felt treasures. My passion is in making realistic felt flower bouquets. I also make seasonal ornaments and embroidery hoop wall art. If you see something you like but want a different color or personalization I welcome custom order requests! Thank you for visiting, check back often to see what other felt creations I have cooked up. Have a feltastic day! I love creating with felt! In my shop you will find a myriad of original, handmade felt treasures. 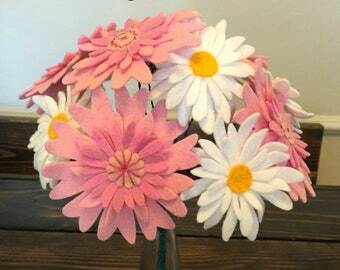 My passion is in making realistic felt flower bouquets. I also make seasonal ornaments and embroidery hoop wall art. If you see something you like but want a different color or personalization I welcome custom order requests! Thank you for visiting, check back often to see what other felt creations I have cooked up. Have a feltastic day! Lovely! Thank you so much for a cute design! I bought this as a gift for my friend. She absolutely loves it. Owls are her favorite animal. I will probably purchase another soon. Wonderful craftsmanship. I am so glad there are still people who can make such beautiful items. Thanks so much. Mini sunflower bouquets now available! Tuck a love note into the pocket of this adorable owl ornament. I finished some felt Poinsettia hair clips -just in time for all your holiday parties! 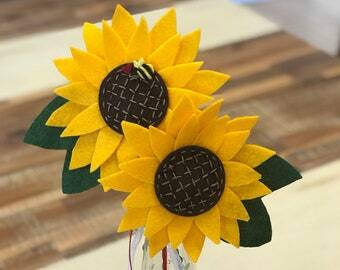 The Delightful Bee creates felt flower bouquets and season felt ornaments. I came to love felt several years ago when I participated in a DIY craft exchange. I made ornaments for each recipient using wool felt. I enjoyed making them so much I began making other items from felt. After I got engaged I fell in love with the idea of making felt flowers for my bouquet and centerpieces. I spent the summer cutting flowers with my Sizzix and sewing them together. My bouquet and centerpieces turned out beautifully. Plus, I will have my bouquet forever- how cool is that? I started playing around with making my own patterns. I designed my own owl ornament, made a few, opened an Etsy shop and listed them. I decided to run an ad and within an hour I had sold my first owl! I shared my success on my personal Facebook page and within a week, three friends asked if I could make them ornaments. The excitement of those initial sales fueled my creativity. I began making baby mobiles, fairy wands, magnets, keychains, and hair clips. I still make owl ornaments but my passion has shifted to felt flower bouquets. It feels good making these little felt treasures for people to enjoy and it makes me happy that people enjoy my work. Welcome to The Delightful Bee. I hope you love my felt creations as much as I enjoy making them! Refunds and exchanges are not accepted unless the item is found to be defective upon arrival. I do not offer refunds on custom orders. I do my best to ensure all custom orders are exactly what you are looking for prior to mailing the item. I accept PayPal only at this time. Custom orders must be paid for before I start work on the item(s). My shop offers calculated shipping. I will refund shipping overages if the calculator overestimates the weight of your items. Pre-Made items usually ship the next business day. Made to order items will ship according to the time frame in the listing. If you need your item sooner contact me prior to paying to see if I can accommodate your request. If you would like insurance or a different type of shipping (other than USPS) please contact me prior to paying. If you don't see what you are looking for in my shop contact me and I will see what I can do. Most listings can be customized to your liking. For example, I can change the colors and facial expressions of my owls as well as add personalizations/dates. I can change the color, amount of stems, add embellishments, and add or remove leaves to my flower bouquets.